Use of Bio Tech significantly helps keep pipes and sewer systems clean, with results seen in an average of just 4 weeks. The more Bio Tech is used, the more it cleans. Bio Tech is a unique, innovative product that generates superior profit margins. It allows selling strong savings because it greatly reduces maintenance costs for pipes and sewer systems. 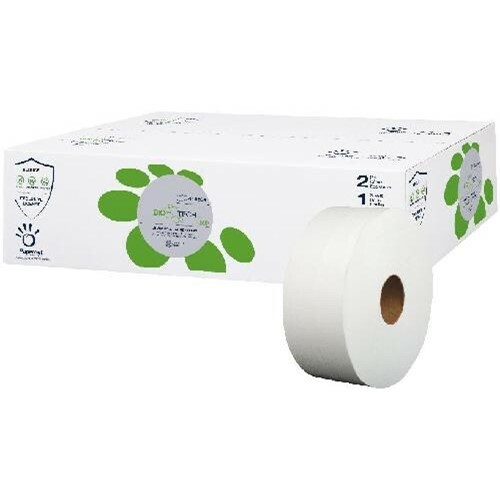 Bio Tech is an innovative toilet paper that utilizes Biologic Active Tissue Paper technology, a European exclusive. It contains five different types of microorganisms totally harmless to people and the environment, each designed to target the major causes of organic waste build-up in pipes. Bio Tech offers a great victory for hygiene and for protecting an organization?s bottom line. When the toilet paper comes into contact with water, the good microorganisms are activated, producing enzymes that feed on the offending organic matter present in the pipes and sewer system. These microorganisms reproduce exponentially and intensify their cleaning action even where it is not possible to intervene chemically or mechanically. The good microorganisms contribute to reducing the bad microorganisms by consuming their food (food antagonism) and further contribute to reducing the surfactants released by detergents in drainage pipes. Once their action is finished, the good microorganisms fully biodegrade, meaning Bio Tech is 100% environmentally friendly. It is dermatologically tested and safe for skin, eyes and intimate areas of adults and children.